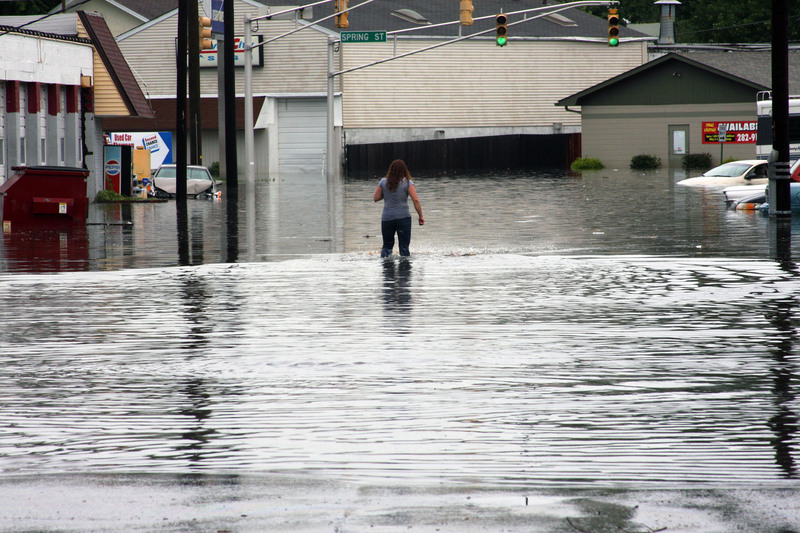 NFIP: The City of Jeffersonville participates in the National Flood Insurance Program (NFIP), which makes federally backed flood insurance available for all eligible buildings, whether they are in a floodplain or not. Flood insurance covers direct losses caused by surface flooding, including a river, lake or stream flowing over its banks and local drainage problems. The NFIP insures buildings, including mobile homes, with two types of coverage: building and contents. Building coverage is for the walls, floors, insulation, furnace, and other items permanently attached to the structure. Contents coverage may be purchased separately, if the contents are in an insurable building. The City of Jeffersonville recently received notice from FEMA that the City meets the criteria for a Level 8 rating in the Community Rating System. The floodplain management activities implemented by the City have qualified it for a ten (10) percent discount in the premium cost of flood insurance for NFIP policies issued or renewed in Special Flood Hazard Areas on or after May 1, 2014. Preferred risk policies are not eligible for this discount. For more information, please contact the City Storm Water Department at 285-6476. The rule applies to secured mortgage loans from such financial institutions as commercial lenders, savings and loan associations, savings banks, and credit unions that are regulated, supervised, or insured by Federal agencies such as the Federal Deposit Insurance Corporation (FDIC) and the Office of Thrift Supervision. It also applies to all mortgage loans purchased by Fannie Mae or Freddie Mac in the secondary mortgage market. How it works: Lenders are required to complete a Standard Flood Hazard Determination (SFHD) form whenever they make, increase, extend or renew a mortgage, home equity, home improvement, commercial, or farm credit loan to determine if the building or manufactured (mobile) home is in a SFHA. It is the Federal agency’s or the lender’s responsibility to check the current Flood Insurance Rate Map (FIRM) to determine if the building is in a SFHA. Copies of the FIRM are available for review in the Jeffersonville Building Commissioner’s office at the City Hall, 500 Quartermaster Court, second floor. Lenders may also have copies or they use a flood zone determination company to provide the SFHD form. If the building is in a SFHA, the Federal agency or lender is required by law to require the recipient to purchase a flood insurance policy on the building. Federal regulations require building coverage equal to the amount of the loan (excluding appraised value of the land) or the maximum amount of insurance available from the NFIP, whichever is less. The maximum amount available for a single-family residence is $250,000. Government sponsored enterprises, such as Freddie Mac and Fannie Mae, have stricter requirements. Knowing whether a property is located within a flood zone and whether an elevation certificate is available for the property are important factors in any real estate transaction. Besides being important from a disclosure perspective, a flood zone determination will help determine if purchasing flood insurance is mandatory for the property in question. With an elevation certificate, properties located in flood zones can receive lower flood insurance rates. Flood Insurance Rate Maps (FIRM) is provided by the Federal Emergency Management Agency (FEMA) to determine flood zones. The Jeffersonville Building Commissioner’s office has paper copies of the current FIRM available for viewing at 500 Quartermaster Court. FIRMS can also be accessed through the FEMA Map Service Center website. FEMA has developed new, more accurate Flood Insurance Rate Maps and has provided the new maps to the City of Jeffersonville, effective 4-16-2014. The new FIRM can be viewed at the City Building Commissioner’s office during regular business hours. Additionally, the interactive map at the top of this website page can be used to help determine if your property is considered in a floodplain. The August 31, 2012, Flood Insurance Study (FIS) for Clark County can be found here or at the Building Commissioner’s office. Ohio River levels are forecasted for the next four days at both the Upper McAlpine and Lower McAlpine gauges. 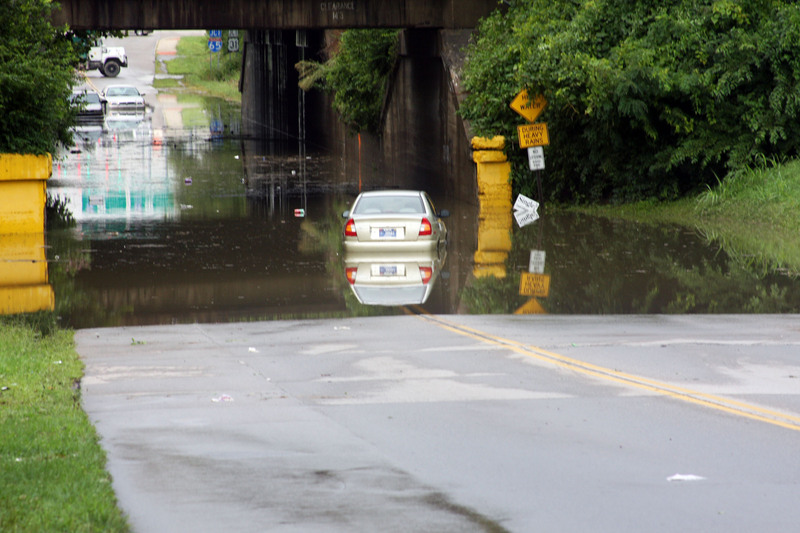 Do not drive through a flooded area. More people drown in cars than any where else. Do not drive around barriers. Be alert to gas leaks. Turn off the gas to your house before it floods. If you smell gas, report it to a Village official or your gas company. Do not use candles, lanterns or open flames if you smell gas or are unsure if your gas has been shut off. Utilities such as heating and air conditioning systems, water heaters and other major appliances can be elevated to higher floors in the structure or on raised platforms. Temporary measures such as moving furniture and other valuables to higher floors or sandbagging exterior openings will also help. Elevating or relocating the entire structure may also be a feasible option. The Village’s sandbagging plan is designed to keep critical roads, buildings and services protected, not to protect every house in town that might flood. All development within the 100-yr. floodplain (not just construction of buildings, but filling, excavation, fences, etc.) 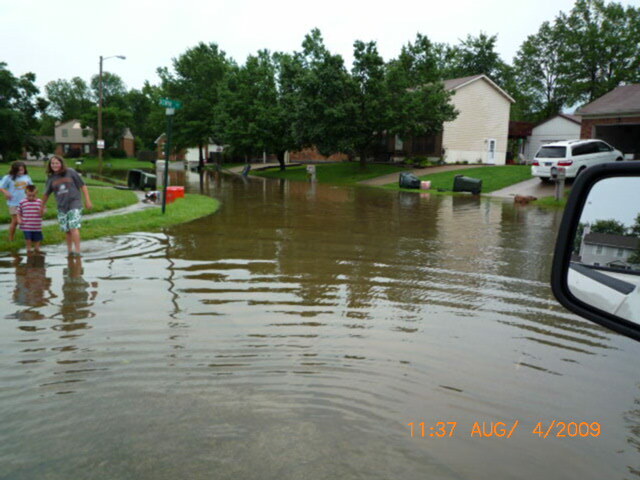 may be required to obtain a City of Jeffersonville permit Applications must be made prior to doing any work in a floodplain area. Please contact the Building Commissioner to receive all the information you will need in order to properly develop in the floodplain at (812)285-6412. You may report any illegal development activities to the above number as well. The NFIP requires that if the cost of improvements to a building or the cost to repair damages (from any cause) to a building exceeds 50% of the market value of the building (excluding land value), the entire building must be brought up to current floodplain management standards. Building improvement projects include exterior and interior remodeling, rehabilitation, additions and repair and reconstruction projects. Floodplains play a valuable role in providing natural and beneficial functions to the area around, and including, Jeffersonville. Floodplains that are relatively undisturbed provide a wide range of benefits to both human and natural systems. These benefits provide aesthetic pleasure as well as function to provide active processes such as filtering nutrients and pollutants from urban stormwater runoff. Floodplains also provide natural erosion control and open space so further flooding damage does not occur. As simple as it may sound, simply keeping smaller ditches and streams free of debris can dramatically improve the run-off capacity of low-lying areas, as well as greatly reduce the occurrence blockage that significantly contributes to flooding. It is illegal to dump materials into the City’s storm sewer system and waterways and violators may be fined If you see someone in the act of dumping or see debris in one of our watercourses, please contact the Stormwater office at (812) 285-6476.